New apartment construction is an expensive and risky proposition, so developers and investors need to have the best information available before making a decision on whether to build a new project. They need to know that the proposed building is a good fit in the marketplace and that its units will be absorbed by the market once built. Will the rents realised be high enough and will the units stay full long enough to provide investors with the best return? Like their name suggests, feasibility studies help determine whether the goals of your project are feasible. Because the rental apartment sector operates differently than the build-to-sell sector, it is important that developers, builders, financiers and investors conduct feasibility studies before initiating new rental apartment construction projects. Specialised knowledge is required to understand what customers want and what the markets will provide. The best way for investors or developers to learn what they need to know before moving ahead on their projects is to commission an apartment construction feasibility study from consultants who are experts in the industry. The biggest challenge for a developer or an investor in conducting a feasibility study comes if they try to do it themselves. Doing so can put the investor far too close to the investigation, reducing objectivity, or limiting their experience. It is too easy for senior participants in a project to bring their own biases or wishful thinking to their analysis, while junior participants don’t have the knowledge or experience in the rental apartment sector to do a thorough and insightful job of preparing such studies. Objectivity is best achieved by industry experts from outside the project who don’t have a stake in the project and can take the objective, long view and provide the most thorough and independent advice possible. When developing new apartment units, it’s important to know which cities and towns are undersupplied in terms of high-quality rental apartments to be sure that they are ready for new apartment construction. Such cities and towns show strong demand for rental apartments and strong average rents. The best areas are defined not only in terms of total population size but also in terms of local average household incomes. Knowing which cities and towns are most ripe for new rental apartments, and knowing what unit mix, sizes, amenities, and rents are appropriate, is knowledge that only comes through a thorough and objective feasibility study. A developer or an investor may commission a feasibility study from an independent broker or consultant who will then use field surveyors to visit as many comparable rental properties (and some condominium properties) as possible in the local market. Such surveyors are trained to compare rental properties in all details, from curb appeal to leasing forms in order to thoroughly assess the project’s competition and to identify the best market position the new development can occupy. The analysis includes the best unit mix, unit sizes, amenities and appropriate rents. 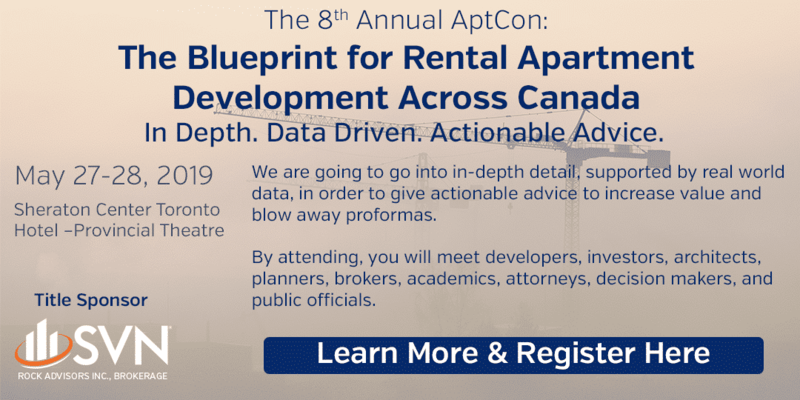 The broker or consultant will also review official census and CMHC data to assess the suitability of the local rental market for new apartment construction, assessing a variety of new construction indicators. The findings of an objective feasibility study conducted by experts in the field will give developers and investors confidence that the rental market is ready to absorb their new construction, and that the rents achieved will provide a good return for the investment. What depth-of-market or demand exists? How many new rental units can be absorbed into the rental market? What unit mix, amenities, and features are appropriate for prospective renters in the local market? What are the highest rents that can be charged? Feasibility studies will also identify the most appropriate target renters such as lifestyle renters, family renters, or student renters depending on the demographic or economic conditions of the market. Based on the advantages and disadvantages of the market the developer hopes to build into, will the proposed project provide a good return on investment? Can such a return be provided if the proposal is modified? Or is it better to wait, or look elsewhere? Properly conducted feasibility studies will make a recommendation based on the data acquired and provide a detailed explanation of the reasoning behind the recommendations. The data that is analyzed will be collected in the field and from official sources. What provides the best and highest use for the proposed project? What best meets local demand and what will result in a successful absorption of the new rental stock with the highest rent per square foot? A Feasibility study’s recommendations should include unit mix, unit sizes, unit features, building amenities, building services, achievable rents (for each unit type), parking fees, utilities, storage fees, curb appeal, landscaping, signage, marketing, leasing, and staff hiring and retention. Recommendations should also include a timeline to help synchronize marketing and leasing with the construction schedule. What Rents Can You Achieve? What is possible for each unit type, given the size of the project? Rent recommendations can be used to prepare unit-by-unit rent grids for the project that help the developer or builder maximize rent revenues and manage leasing during the lease-up stage. Recommendations are also used to generate income/expense analyses that compare potential revenues with construction costs to help determine if the project is feasible. Have you lined up financing for the project? Where you can get such financing? What financing or mortgage insurance Canadian Mortgage and Housing Corporation (CMHC) provides for new apartment projects. Do you have a plan for the lease-up of the new rental apartment property? How soon should leasing start? What are the best techniques for successfully leasing newly constructed apartments in the shortest time while achieving the highest rents? What is the best way to select and hire leasing staff? How should leasing staff be motivated to perform? What should be included in a marketing plan? When should marketing start—before, during, or after construction? What type of marketing works best for newly constructed rental apartments? How can the internet and social media be used effectively? How can an effective web presence be created and maintained?